Welcome to the monthly e-bulletin of the South Asia Media Solidarity Network(SAMSN). The next bulletin will be sent on March 16, 2015, and your inputs are most welcome. 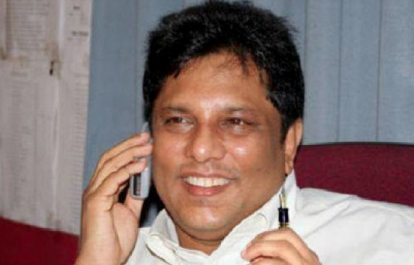 The newly-elected Sri Lankan government has decided to reopen investigations into the 2009 murder of newspaper editor Lasantha Wickrematunge. Wickrematunge, the founder and editor of The Sunday Leader, was assassinated on January 8, 2009, by four assailants who stopped him on his way to work and opened fire on him. Wickrematunge was a vocal critic of former president Mahinda Rajapaksa’s government and at the time of his murder was involved in a legal fight with Rajapaksa’s brother, the then-defense secretary Gotabaya Rajapaksa. The new Sri Lankan government’s decision to reopen the investigation came after a former cabinet minister publicly accused Gotabhaya Rajapaksa, the brother of former president Mahinda Rajapaksa, of ordering the assassination of Wickrematunge. Wickrematunge posthumously received the UNESCO/Guillermo Cano World Press Freedom Prize in 2009 and was declared a World Press Freedom Hero by the International Press Institute in 2010. Read more here. Subodh Bose, the president of IFJ affiliate All India Newspaper Employees Federation (AINEF), passed away in Kolkata, India on Friday, February 13, 2015. He was 84. Subodh Bose entered journalism in the 1950s and throughout his career was an active trade unionist and journalist. As one of the builders of the AINEF he served as secretary, vice-president and then finally president. He also served as president of the West Bengal Newspaper Employees Federation and the ‘Jugantar’ Employees Union, the paper he ultimately retired from. The IFJ joins the AINEF in expressing heartily condolence to the family and colleagues of Bose. Read more here. Media across India this month protested the arrest of Shirin Dalvi, the editor of Urdu daily newspaper Awadhnama in Mumbai, India on January 29, 2015 for republishing a cartoon from January 17 issue ofthe French satirical magazine – Charlie Hebdo. Dalvi, the 46-year-old editor, was arrested in Mumbra, Mumbai’s financial district and later released on anticipatory bail. The Awadhnama newspaper was closed following the arrest. Dalvi was charged under section 295A of the Indian Penal Code, which bans malicious and deliberate acts intended to outrage religious feelings. Several complaints were lodged to police after the paper reprinted the Charlie Hebdocover image of Muhammad. The original cartoon was published in response to an attack on the magazine after gunmen stormed its Paris office on January 7, killing 12 people. The arrest was made despite Dalvi’s apology the day after the edition carrying the cartoon was published. She has since been forced into hiding and started wearing a hijab due to a number of violent threats. Read more here. On February 1, police allegedly assaulted Nazmul Huda Suman, the Dhaka University correspondent of the English daily New Age, and his friend for taking photographs of a policeman riding as a passenger on a motorcycle. Bangladesh authorities have recently banned riding as passengers on motorbikes in the wake of arson and crude bomb attacks across the country. A group of policemen led by Sub-Inspector Mehedi Hasan Suman, of the Ramna police, attacked Suman despite the journalist producing his press identity card. The police beat Suman and his friend on the street, in the police car and, later, at the Ramna police station. He sustained injuries in his head and other body parts. Read more here. The Afghan Security Agency arrested a suspect in the murder of British-Swedish radio journalist Nils Horner in Afghanistan in 2014. On January 30, 2015, the Afghan security agency announced the arrest of a commander of the terrorist organization, Mahaz-e-Fadaiyan. Horner, a 51-year-old Hong Kong-based journalist working for Sveriges Radio, was killed in a rare daylight attack in Kabul in March last year, only a few days after he arrived in Afghanistan. Two weeks after the attack, Mahaz-e-Fadaiyan, a Taliban splinter group, claimed responsibility for the attack, accusing Horner of being an MI6 spy. Read more here. India’s most famous satirist and the creator of the iconic ‘Common Man’ series of cartoons that appeared in front page of The Times of India for more than five decades, Rasipuram Krishnaswamy Laxman, 94, but known simply as Laxman, passed away on Monday, January 26, in hospital. Laxman, who was born in Mysore, Bangalore in 1924, died after complications from a urinary tract infection. The eminent cartoonist was ill for many months and was admitted to the hospital on January 16 after he complained of breathlessness. The legendary cartoonist is survived by his writer wife Kamala, retired journalist son Srinivas and daughter-in-law Usha. More information is availablehere, here and here. Notably, in 2011, the Ministry of Mass Media and Information introduced a registration requirement for websites bearing content ‘relating to Sri Lanka or the people of Sri Lanka’, a dangerously broad definition. As argued in a 2012 Supreme Court petition by the Free Media Movement, the policy has no legal basis, and moreover violates the right to freedom of expression. The Court however rejected the petition, terminating the possibility for a high-profile public debate on the scope of online freedom of expression. The same year also saw the extension of the notoriously harsh 1973 Press Council Law No.5 to include online news websites, banning publication of profanity, obscenity, ‘false’ information about the government or fiscal policy, and official secrets. In a write up on GroundViews, Celie Davier explores the restrictions imposed in past, international obligations of Sri Lanka and new hopes. More here. A group of protesters torched a vehicle of Kantipur Publications in Bara, Nepal on February 13, 2015. Stating that their news wasn’t published on the front page of the newspaper, the protesters torched a publication vehicle carrying the day’s newspaper in Kalaiya. The protesters stopped the publication vehicle in Kalaiya bazaar to looked for their news but started vandalising the vehicle when they realized it wasn’t published on the front page. Read more here. Federation of Nepali Journalists (FNJ) has warned of stern protests against the government and the management of different media houses if they did not take immediate steps to implement the Working Journalists Act. FNJ has concluded that the delay in implementing the Working Journalists Act resulted from the lack of seriousness on the part of government and media houses. After holding a consultation with different journalist bodies at the FNJ office, the umbrella body of journalists, through a press statement said that it will continue to push for the implementation of the Act via protests and talks. Read more here. Assam Chief Minister Tarun Gogoi has ordered a high-level investigation into the alleged assault and molestation of a woman reporter at the Latasil police station. The announcement followed intensive protests from journalists demanding the suspension and arrest of two police officials said to be involved in the case. The TV journalist and her cameraperson, working with DY365 news channel, were allegedly assaulted by two police officers, an Inspector and a Sub-Inspector, at the Latasil police station, near the Gauhati High Court. The pair was at the police station to investigate reports that a police quarter was being rented out to a private person. Read more here. 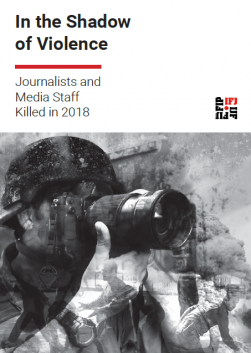 South Asia has fared poorly in Reporters Without Borders (RSF) World Press Freedom Index 2015 with Sri Lankan rating the worse in the annual index. 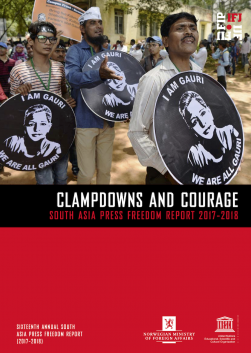 In fact it was a grim picture with no South Asian country ranked below 100 in the survey, clearly demonstrating the the region’s poor records in press freedom. Nepal is the only country which made some improvement in ranking – up 15 places thanks to a drop in violence by the security forces against journalists, particularly at demonstrations. India and Afghanistan showed improvement in ranking going up four and six places respectively. But in the face of this the report also noted that there has been no let-up in the hatred that the Taliban display towards the media in Afghanistan. 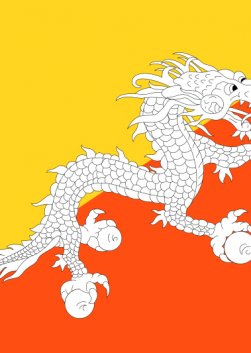 All other five countries in South Asia saw the decline in the ranking with Bhutan sliding 12 positionsbut remains the highest ranked South Asian nation at 104. It was followed by Nepal (105), Maldives (112), Afghanistan (122), India (136), Bangladesh (146), Pakistan (159), and Sri Lanka (165). The RSF noted that there was a drastic decline in freedom of information in 2014. Two-thirds of the 180 countries surveyed for the 2015 World Press Freedom Index performed less well than in the previous year. The annual global indicator, which measures the overall level of violations of freedom of information in 180 countries year by year, has risen to 3,719, an 8 percent increase over 2014 and almost 10 percent compared with 2013. The decline affected all continents. Access the full index here. This week on the SAMSN Blog Dilrukshi Handunnetti discusses the challenges for women journalists in Afghanistan. In November 2014, Dilrukshi conducted a gender safety workshop in Kabul with 25 journalists from across the country as part of her contribution as a SAMSN regional gender coordinator. The participants discussed the challenges for women journalists and the little opportunities to enhance their understanding on issues connected to gender and safety despite their relevance.